Fabric is made by replacing the weft yarns with having interlacement of the warp yarns in the weaving process which is determined by fabric structure design following top view of the cloth felland the horizontally clothes are designed to make them attached together. The process of containing these operations are done by the instruments of loom primarily through four mechanical process. 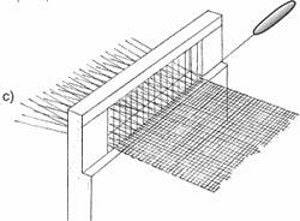 The yarns are processed to be releasing from the warp beam to control the yarns from bar along the front from the back to the rest vertical and to defend the shrinkage vertically by proceeding on the front. This mechanism is called ' Let off mechanism '. This is the first operation of loom to allow the passage of yarn into the next processing step. Through the process of ' let off mechanism ', the yarns are delivered to forward tension with the vertical line. When the yarns come forward through the operation of ' Drop wire ' system, the yarns are processed to loosen the tension and delivered into the 'Heald frame’ (where heald eyes are placed with line by line together). 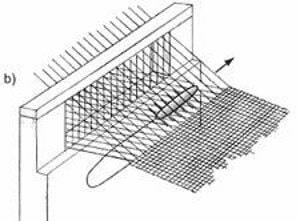 The individual end of the warp beam is pulled through the individual ‘Heald eye’ which is located is in center of the heddles of heald frame. The individual heddles are mounted in a harness or heald shaft that allows the warp yarns to be controlled in groups. The number of harnesses on a loom helps to determine the complexity of fabric design that can be produced. Figure. 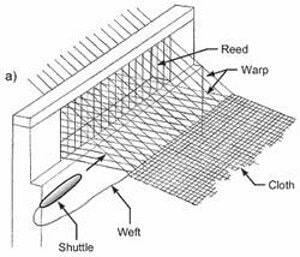 2: The warp ends are controlled to be divided between two sheets to produce shed. The two heald frames are run separately with help of a ‘Treadle Lever’. These treadle levers are handled by the reverse friction process of ‘Treadle Bowls’ which are mounted on the top and bottom shaft of treadle levers. 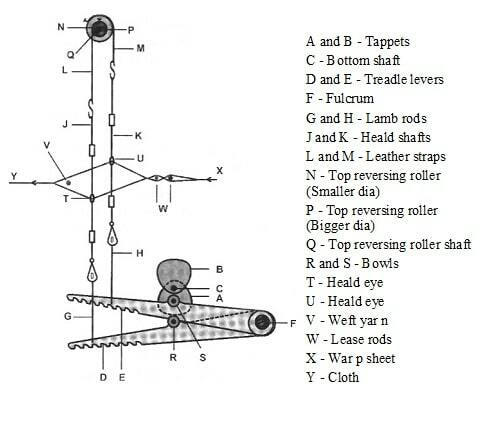 The reverse friction process is accomplished by Tappet Shaft. On the above there are two hanging heald frames with a roller rope and are attached to treadle levers. Through the roller of this lever, the ropes are attached with the heald frame. When one heald frame is raised, the heald eyes of another side heald frame are below under that frame. This way half of the warp yarns of that frame rise to produce an opening between two sheets of warp yarns. This opening known as Shed and this motion of loom is called Shedding. Figure.3: The heald frames are moving in control by tappet shaft with the help of treadle lever. After opening the shed, a path is produced through which the filling is inserted. 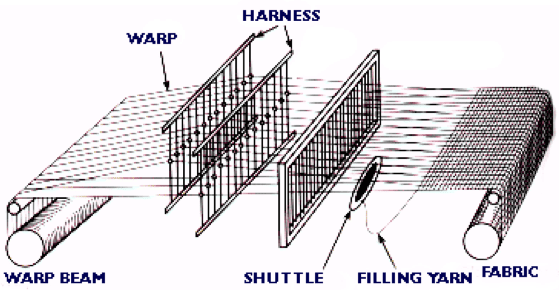 The filling is inserted horizontally up and down surface of warp yarns by the shuttle moving in principle across the shed. This loom of motion filling the insertion of weft yarns is called Picking. In addition to the shuttle; the Air jet, Rapier, Projectile can be used to replace the yarn through across the shed. Figure. 4: The filling of insertion through across the shed of warp yarns. After replacing the horizontal yarns (filling insertion of weft yarns) with the operation of picking; the yarns are made up integrated sheet of fabric surface. With the effect of Let off mechanism, the yarns are placed without moving at particular place with the help of ‘Reed’ by warp stop motion. Then the filling insertions are combined by pushing horizontally with the interlacement of warp yarns. The ‘Sley Sword’ mechanism is used to pushing the weft yarn and this motion of loom is called Beating. This last combination of Beating is presenting the weaving cycle of a loom. Figure. 4: The filling insertions are combining with the interlacement of warp yarns. The last operation of weaving in loom is Take up. After the Beating process, the cloth fell is taken up by cloth beam. It is operated by help of ‘Let off mechanism’ by which the warp yarns are delivered from the warp beam from the back part of the loom. The front part operation of loom is winding the cloth fell, as it is formed. The part of this motion of loom is called Take Up.